On November 26th, 1941, a Japanese task force with 6 aircraft carriers left northern Japan. Eventually they ended up northwest of Hawaii. On December 7th the Japanese Navy dragged America, reluctantly into World War II. As dawn broke on a fair Sunday, the Japanese task force swung to port and headed into the 14-knot wind. The carrier's increased speed to around 24 knots and started to prepare to launch the first wave. The first wave had one hundred and eighty-three planes were launched into the wind of the Pacific Ocean north of Hawaii. Tasked with attacking the most valuable targets, the first group was armed with 800 kilogram armor-piercing bombs, and type 91 torpedoes. The second group was assigned Ford Island and Wheeler Field, and armed mostly with 249 kilogram multi-purpose bombs. The third group was supposed to attack the aircraft. The second wave was divided into three groups and was directed toward Kan’ohe and Pearl Harbor proper. After the attack 2,403 Americans were dead and 1,178 wounded, all of whom could be considered non-combatants, since Japan had not declared war. It is alleged that the attack was not supposed to take place until thirty minutes after the US had been informed of the end of peace negotiations. However, the length of the message made transcription difficult and the Japanese ambassador could not deliver it in time. Eighteen ships were sunk or run aground. Damage was extensive and terrible. But, the attack fell short of the stated goals. The United States military, significantly the Navy, was wounded, but not crippled. After being forced to concede most of the Asian theater the allies went on the offensive. It signaled the end of the era of the battleship, and launched the supremacy of the carrier. rapidly expanding war in Europe. Even as the situation deteriorated, nations fell, France and Great Britain declared war on Germany, Congressional isolationists rebuffed Roosevelt’s argument that neutrality may give “passive aid” to the enemies of America’s friends. After December, 7 the argument was over. 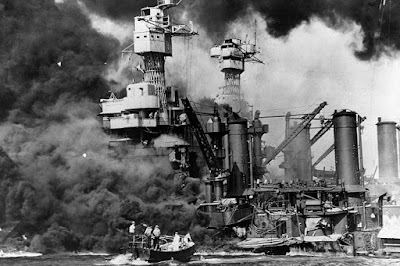 It was truly a “a day that will live in infamy.” It was followed by a war that proved how small the world had become. And when it was over everything had changed. It would be wise to remember that.